One of the things I find interesting as a long-time Yankee fan is examining the big league careers of former Yankee prospects who’s paths to the Bronx were blocked by good players already in their positions. Take David Adams as an example. He’s been being groomed as a Yankee second baseman for the past five years even though the only way Robbie Cano would lose that job is if he chooses to leave it as a free agent after this season. The obstacle blocking today’s Pinstripe Birthday Celebrant’s ascent to the Yankee roster in the mid 1970’s was the all star first baseman and postseason hero, Chris Chambliss. Dave Bergman was a good enough player in high school to get drafted by the Cubs in the 12th round of the 1971 amateur draft but he decided to attend college instead. Three years later the Yankees drafted him in the third round. If he’d signed with the Cubs the first time around and took five years to make it to Wrigley, he’d have been challenging guys like Pete LaCock and Billy Buckner instead of Chambliss. 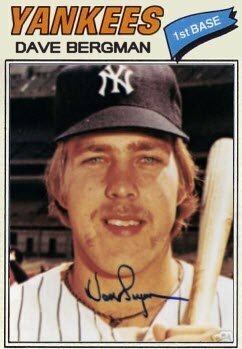 By 1977, Bergman had put together four consecutive strong seasons in New York’s farm system, averaging well over .300 with an on base percentage in the .430 range. The only thing he had to show for it however was a seven-game cup-of-coffee preview with the parent club at the end of 1975 and another five-game late-season call-up, two years later. So as often happens with an organization’s good but unneeded prospects, Bergman was traded to fill an immediate need on the Yankees’ big league roster. With his 1977 club again in the hunt for the AL Pennant, Yankee GM Gabe Paul was looking for a right-handed bat with power that Billy Martin could use to dissuade opposing teams from bringing in lefthanders to pitch to Yankee slugger Reggie Jackson. So in June of that year, Paul swung a deal for Houston’s Cliff Johnson. Bergman was the Yankee player to be named later (in November of ’77) that was included in that swap. The trade was an opportunity for Bergman to finally spend an entire season in the big leagues, as he took over Johnson’s old role with Houston as a backup first baseman and outfielder during the ’78 season. He hit just .231 that year in 104 games and spent the next two seasons going back and forth between the Astros and their top farm team. Then right after the 1981 season started, Bergman was traded with Houston outfielder Jeffrey Leonard to the Giants for first baseman, Mike Ivie. He spent three decent years in San Francisco and then finally found his home in the big leagues. Toward the end of the 1984 spring training season, the Giants traded Bergman to the Phillies. On that same day, before he could say “the City of brotherly love” Philadelphia traded Bergman and reliever Willie Hernandez to the Tigers. That trade was the key to Detroit becoming World Champions that year, but not because of Bergman. Don’t get me wrong, the native of Evanston, IL had a great first season in Mo-Town, becoming a favorite guy off the bench for manager Sparky Anderson, appearing in 120 games and averaging .273. But it was the relief pitching of Hernandez that turned that ’84 Tiger team into World Series winners. Bergman spent the next eight seasons playing for Anderson whenever the need arose and loving every minute of it. When he retired after the 1992 season at the age of 39, he had played in 1,349 big league ball games. Bergman shares his birthday with this Yankee legend.